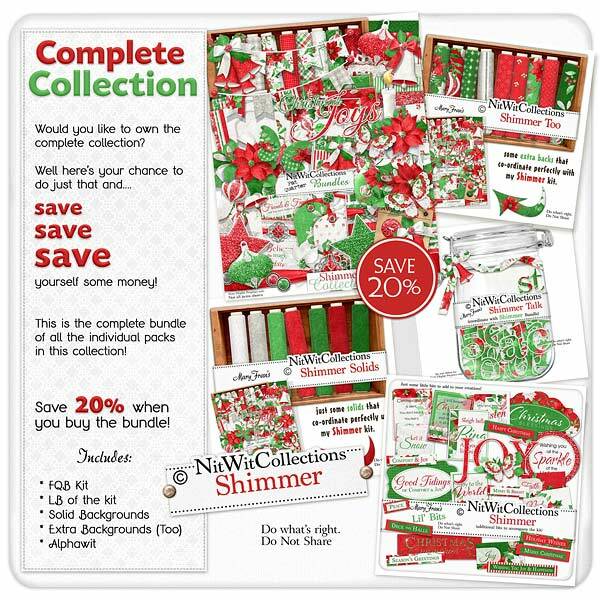 "Shimmer" Collection is everything that its name implies....a sparkling, shimmering and shining digital card making and scrapbooking Christmas kit! We received many emails letting us know how much you loved our Sparkle Collection from last year and that you'd also like to see it in traditional reds and greens...and we've listened!! The colours of this digital kit will leave you wanting to create and create! Now it is not only the colour that will draw you in, but the sparkling Christmas elements and background papers! The bells, poinsettia, ornaments and more give you such great creative tools for "Shimmering" results on your mini albums, cards and scrapbook layouts!